Search out those maternity gym clothes – it’s time to hit the yoga studio! Being pregnant is about so much more than just carrying your baby. Keeping your body and mind healthy and well balanced is a priority for any mum-to-be. Basic yoga techniques are designed to be suitable for pregnant women; helping to enhance health and fitness, while also gaining that important muscle strength you’ll need for labour. Even if you’ve never tried it before, yoga has a lot to offer. Here, a first time pregnancy yoga fan tells us how it happened for her. Invest in a yoga mat now – and you’ll reap the benefits in labour. Before I became pregnant I was a real gym bunny. I used to get up at 6am to fit in an hour’s workout before heading into the office. Quite what I was thinking I don’t know! Those days are gone for the moment because I take every precious second of sleep that I can get. I’m well into the second trimester and I’ve been suffering from really bad heartburn, plus I find that I need to get up and wee at least twice during the night. 6:30am used to see me hard at work in the gym – now it sees me snoozing peacefully in bed. Or at least I presume it does, I’m not awake to check! Unfortunately, I am one of those women who experienced hyperemesis gravidarum (severe morning sickness) during the first trimester of my pregnancy. I was signed off work because I was just throwing up constantly – nothing seemed to ease it and all I could keep down were ice chips. Needless to say, I abandoned the gym pretty much instantly. I’m 21 weeks now and it’s only been in the last couple of weeks that I’ve felt recovered enough to start thinking about exercising again. Because I had such a long time off, I spoke to my personal trainer for guidance on starting back up again slowly. However, she had other ideas. She said that while she’s all for pregnant women continuing to train whilst they’re able to, she just felt that in my case I might be better off with a much lower-impact type of exercise. She told me my body had been through a lot already and the chances are that it wouldn’t appreciate being flung back into a demanding exercise regime so soon. She added that this is the policy that the gym followed for IVF clients. “They’re at a higher risk so we recommend lower demand forms of exercise,” she explained. She told me it’s not just about swimming, although she said that prenatal aqua classes are specially designed for pregnant women and I wouldn’t be expected to swim lengths for an hour. No, her idea was pregnancy yoga. The next thing I knew, I had a leaflet in my hand, bearing details of the classes. “Go on, give it a go,” she said, smiling. I did my research carefully, learning about exactly what yoga is and what it does. Holistic therapies, yogic techniques, deep relaxation and self-hypnosis featured heavily in my reading. Yoga concentrates on establishing the balance between mind, breath and body, and keeping strong would help me stay supple and fit during my pregnancy, I decided. It had to be a dedicated prenatal yoga class, because in the ordinary ones there are postures it wouldn’t be safe second trimester pregnant women to do. Things like strong twists, back bends and lying on my tummy were all out of the question. Yoga clothes were surprisingly easy to find – and surprisingly comfortable to wear! I’d been imagining skin tight lycra, like everyone wears in the gym, but no. Standard yoga wear is quite loose fitting, thin tracksuit bottoms, conveniently called yoga pants. And for us ladies with bumps, a maternity t-shirt, or a long vest top is perfect. That said, not everyone was wearing specific yoga clothing and it looked like anything that was loose and comfortable was ok. No shoes required; just a yoga mat and a bottle of water and I was set. I found my first class absolutely absorbing. 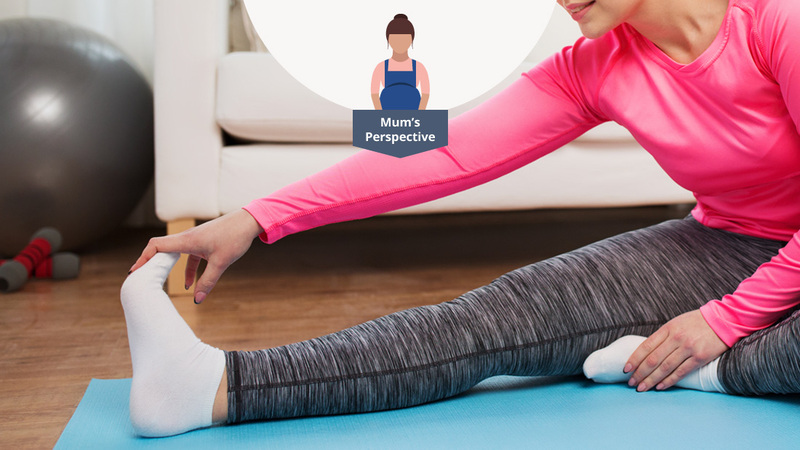 We started with stretches for our arms, legs and back with the focus on staying evenly balanced – easier said than done for the ladies with larger bumps! After the warm-up we began concentrating on postures aimed at helping with endurance and strength. The first postures (or asanas, as they’re called) were nice and easy and I had no trouble following them. Then we did some breathing exercises (pranayama) and we were told that these techniques would be good for managing pain in the early stages of labour (I pushed that thought out of my head though). My class lasted for around 90 minutes, but it felt a lot shorter. At the end I felt energised, relaxed and calm and it was nice to sit down with a few of the others and chat about pregnancy-related stuff. My yoga classes so far have been such a lovely, positive experience and I’ve already learned a lot. And despite my dislike of swimming, yoga does lead on quite naturally to water-based therapies and prenatal aqua classes, so I’m keeping an open mind about whether that might be something I’d find useful towards the tail end of my pregnancy. Before I started these classes, I read that around 86% of people attending pregnancy yoga had never stepped foot in a yoga studio before. I was quite cheered by that statistic, and by the end of my first class I was pretty firmly of the opinion that out of those 86%, 100% would be coming back again.